I’m conflicted about red light cameras. I do believe that they reduce accident risks when drivers know they are there. As a father who often drives with my kids, safety is important to me. Like anyone else, I don’t want some rushing moron blasting into the intersection against the light. So, why am I still bothered by red light cameras? Despite the enhanced safety, I still have a nagging feeling that these cameras are not right. Perhaps this is a bit idealistic, but if I knew that police were pushing for them with safety being their primary motivation, I wouldn’t feel this way. But honestly, we all know that red light cameras are major revenue generators, and money is the motivator. Maybe I’m paranoid too, but I do not like the big-brother, creepy feeling they give me. The feeling that YOU ARE BEING WATCHED bothers me. Why, though? How many cameras capture our image in the course of each day? I’m willing to bet quite a few. There are cameras at ATM’s, at the grocery store, at the gas station, and on and on… These don’t seem to bother me so much. These are common-place now – expected. Perhaps that is the answer… Red light cameras are relatively new. Maybe that’s the reason they kinda’ creep me out still. As is the case with many new technologies and changes in life, sometimes they just take time for adaptation. They are here (and it seems they will remain). Most of the cities in DuPage County have them – Naperville, Warrenville, Wheaton, Downers Grove, etc. 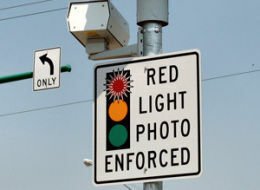 What are your thoughts on red light light cameras? I just received a red light ticket in the mail last night and was horrified by the soulless-ness of it. A robot camera and a computer printout mailed to me — no sign of human involvement at all, telling me that a rolling stop at a right turn on a red light, well before any opposing traffic could reach me, was a crime worthy of a $100 fine. If a cop had been there and made that judgement call I might be okay with it now, but this notion of automated justice just sickens me, and should sicken everyone else too. 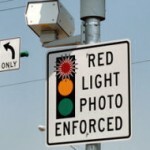 I totally agree… The red-light cameras have become money-making machines. $100 for a rolling-stop right-turn is crazy. There is clearly no threat to safety in such situations. The fines should be reserved for instances where someone’s safety is threatened by flat-out running through the red-light. It has been proven that red light cameras do nothing to prevent accidents so they are strictly money making machines. If I could get away with it, I’d tear them all down.